Any engineered nanomaterials should undergo thorough investigation on risk and health hazards imposed by them before available in the market for consumption. Graphene, a 2D carbon based material with hexagonal lattice structure along with its inherent physicochemical properties is going to revolutionize the future of nanotechnology especially in the field of biomedicine. Increase in industrial large scale production and anticipated use of graphene concurrently created anxiety about their safety towards biological systems. Fig. 1. Mechanism of toxicity induced by graphene. Graphene enters the cell either by penetration of lipid membrane or via endocytosis. Inside the cell it induces the formation of reactive oxygen species. ROS causes mitochondrial membrane depolarization releasing proapoptotic factors and activates caspases eventually leading to cell death. There are various factors that govern the toxic potential of graphene such as size, shape, lateral dimension, surface chemistry, dose, duration of exposure and the biological milieu. Despite several findings supports the biocompatibility of graphene and its derivatives, very few reports stated the undesirable toxic effects of these materials. Graphene oxide (GO), an oxidized form of pristine graphene carries negative charge owing to the presence of oxygen containing functional groups such as carboxyl, epoxy and hydroxyl groups on the surfaces. Hydrophilic GO can be further reduced to form hydrophobic reduced graphene oxide (rGO). Both GO and rGO is known to induce cytotoxicity, DNA damage and oxidative stress in mammalian cells. Graphene can cause physical damage to the cell membrane because of the sharp edges causing leakage of cytoplasmic contents. Once inside the cell, graphene was mainly located in organelles such as mitochondria, lysosome, endoplasm and nucleus. 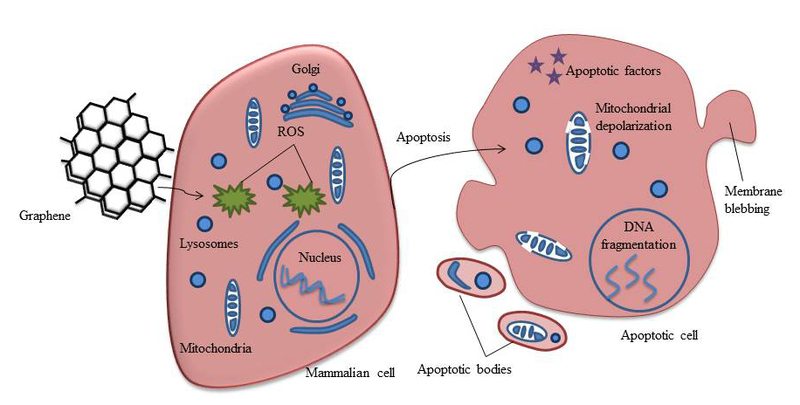 In vitro studies indicate that graphene induces cytotoxicity as a result of increased reactive oxygen species formation and also by disrupted mitochondrial membrane potential eventually guide the cells to undergo apoptosis (Fig. 1). Marked decrease in the expression of cell adhesion proteins such as laminin, fibronectin, focal adhesion kinase (FAK) were also noticed after GO exposure. Expression of pro-inflammatory cytokines (IL-1α, IL-6, IL-10, TNFα, GM-CSF, MCP-1, MIP-1α, MIP-1β) were upregulated in macrophages after graphene exposure. Under in vivo conditions, mortality was observed in mice administered with GO due to pulmonary congestion. Occupational exposure during nanoparticles manufacturing is the most common exposure scenario for human. The potential environmental risk associated with these carbon materials that was overlooked so far needs to be addressed in order to avoid unintentional exposure or leaching of these materials into the ecosystem. Safety and biocompatibility of graphene: A new generation nanomaterial for biomedical application.